I don't think I have mentioned this yet, but I have been invited to be a Freschetta Fresh Connection blog member. It's pretty much like I'm famous, without the money, or the fame part, but add in some pizza. They will be sending me some coupons to try various products and review them, and then offer them to you, my blog readers as well! I hope they realize that I am a very honest person. I can't lie. But so far, it's been pretty good stuff. So....there's a contest on today's blog! Keep reading until the end and enter, and you could win a 3 piece Freschetta storage set (tupperware style set - they sent me one, it's awesome) and a coupon for FREE Freschetta by the slice pizza! Freschetta by the Slice is essentially Freschetta pizza....but just one slice (I guess that's self explanatory), and is prepared in the microwave. I was a bit nervous about microwave pizza, but am never one to turn down free stuff. 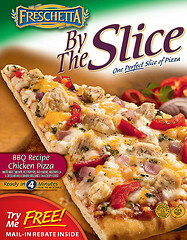 I choose the BBQ Chicken flavor (other flavors include Veggie medley, Chicken, Spinach and Mushroom and 6 Cheese). I do have to say, one criticism was the flavor choice. I'm a bit of a traditionalist in this category and would have liked to see a simple cheese, or pepperoni. I get what they are going for, but I think they could be simplified a bit. Jeremy actually tried the pizza last night when he arrived home from a bachelor party in Vegas. He did not get home until 9pm and it made for a nice little late dinner. * Portion controlled, really, should anyone eat an ENTIRE pizza? No. But a lot of people do. Instead, try a piece of pizza....with some veggies on the side! * Flavors were a bit over-complicated. I would have liked something more simple. *The BBQ sauce was fairly sweet. Overall he thought it was a great option to have in the freezer when you need a quick lunch or dinner. Nutrition facts were a bit high for a lunch, but if paired with a salad or some other vegetable, it would be a great option. One lucky reader will win a smaller 3 piece version of the Freschetta storage system plus a coupon for a complementary Freschetta By The Slice pizza! To enter this contest, leave a comment on this post by April 13th, 2011 at 12:00pm CST. This contest is open to U.S. ADDRESSES ONLY. Please leave your email address. I will choose one (1) winner using Random.org and will be announced as a comment on this post. The winners will also be notified by email and/or through a comment on their blog (if available). as much as I love pizza I think your followers are waiting for the OPRAH blog!! Im dying to hear about it! Great seeing you this past weekend! Enter me in as well I love tupperware! Kara, Kara, Kara!!! Your local Roseville SuperTarget has the new Freschetta by the Slice!! They are perfect for a quick office lunch...you should pick one up for your faithful assistant! :) I think she'd like either BBQ chicken or 6-cheese although she won't tell me which one. Thank you for your wonderful review and congrats to your winner!